Sridev Suman University MA Hindi 1st Year Back Paper Updated Result 2015 :- The Sridev Suman University is one of the leading universities of the Uttarakhand state. It is becomes a main university of Garhwal Uttarakhand after the Hemwati Nandan Bahuguna Garhwal University. The Sridev Suman University is located in the Badshahithol Tehri Garhwal Uttarakhand and it offers various courses to students. As of now the Sridev Suman University has announced the result of MA (Master of Art) 1st Year Back Paper Examination 2014. And the result is updated from all previous results. Kumaon University M.Com 1st & 2nd Year Back Paper Result Declared:- The Kumaon University is one of the main universities of Uttarakhand. It is located in the Nainital the lake city of India. It offers various Post Graduate and Under Graduate courses to students. And every year many of the students are enrolled in this university for their studies. So as of now the Kumaon University has announced the result of M.Com (Masters of Commerce) 1st & 2nd (Previous and Final) Year Back Paper or Improvement Examination 2014. 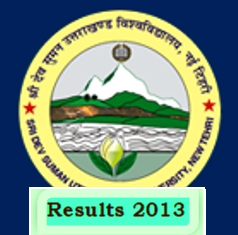 Sridev Suman University MA 1st Year Philosophy & History Back Paper Exams 2013 results declared: -Sridev Suman Uttarakhand University is now a leading University of Uttarakhand. It offers various PG & UG Private Courses to students. Before this University all the courses in Garhwal Region are provided by HNB Garhwal University either it is regular or private but since last year the private courses are conducted by Sridev Suman University. So as of now the University has declared the result of MA (Master of Arts) Philosophy and History 1st Year Private Back Paper examination 2013. The Exams was held in Nov and Dec 2013 and now the University declared their results. Sridev Suman University M.Com 1st Year Private Back Paper Exams 2013 results declared, SDSUV.AC.IN: -Sridev Suman University is the newly University of Uttarakhand it is started from last year. The head quarter of the Sridev Suman University is situated in the Badshahithol Tehri Garhwal Uttarakhand. There are many of students appeared in the M.Com 1st Year private back Paper examinations 2013. The examinations were held some month ago and as of now the Sridev Suman University declared the results. So now all the student of M.Com 1st Year private stream can check their Back Paper results easily online. The results are available in the official website of Sridev Suman University.